The first step towards an appropriate and quality tint job is to find the right tint shop, but it can be difficult to decide when there are so many choices. For example, there are over 20 different tint shops within a 20 mile radius of a large metropolitan city. So how does one make a sound decision between them? What sets a “Quality Window Tinting” apart from a “Tint King” or a “Tint Doctor”? Here at TintCenter.com Window Tinting Guides, we recommend that you take your time and do a bit of research. Start by making a list of 4 to 5 tint shops that look promising, and then simply approach them for information. You can get good tip-offs by asking co-workers, friends, or family members with tinted cars where they got the job done and if they’re happy with it. You can also take a look through the Yellow Pages and take down the details of shops with the most professional-looking adverts, and – if you’d like to do it the easy way – you can use our handy quote service and get price quotes from local tint shops. Have you been in the area long? What other areas do you serve? Tint businesses that survive in a certain location for years without moving generally do so because they provide consistently great service at affordable prices. A tint shop that has been in business for around 5 years will be your best bet. Even if they are slightly more expensive than the newer tint shops you are scoping out, having a strong history tells you that they will likely still be around in a few years’ time in case you need to follow up on your warranty. In many cases, a tint shop that is managed well and becomes a local success will branch out into other cities. Of course, you might find yourself dealing with a newly-trained branch, but in either case, the fact that they are successful enough to expand branches means that they truly care about the quality of their products and services. What are the different products that you use? Do you offer a warranty? Tint shops that are worth their salt always deal in a variety of different window films, typically from multiple suppliers. These shops will offer a full range of film types including metallic, dyed, and hybrid film, and will have these in varying levels of darkness and more than one color. If the tint shop you are enquiring about only offers you a choice of one or two types of film, you should be very wary; it’s possible that they are simply trying to get rid of old or cheap stock (which may not even be suitable for your car in the first place). When asking about their warranty plan, make sure you understand all that is included in it. Your best option is a lifetime warranty for labor and materials, and we here at TintCenter wouldn’t recommend anything less. You should also confirm that the warranty covers problems like fading and color shift. Please note that manufacturer’s warrantees will only be valid for legal window tint. Tint that doesn’t comply with local or state laws voids the warranty, so don’t forget to ask for the dealer’s warranty card with details such as the date, type of window film installed, and the total cost along with your receipt. Where can I see samples of your tinting? Can I come in and see it for myself? Because a great salesperson may be able convince you of how great the business is over the phone, the best way to find out whether they are worth your money is to visit the tint shop in person. Even just 10 minutes inside should be enough to give you a good feel for the type of business you are dealing with. Customer service is always a number one priority for good tint shops. When you engage with the employees, are they warm and friendly, or unpleasant? Do they seem genuinely interested in helping you, or are they disinterested and cold? These are all things you should pay attention to, because if they are not willing to give you the time of day before you are even a customer, it might be difficult to deal with them later if you ever have problems with your tint. Next, ask them to show you a car that has already been tinted. Go ahead and inspect the rear window. How has the window film been cut, in strips or in one single piece? The most professional tinters use only one full sheet to cover the window’s surface. 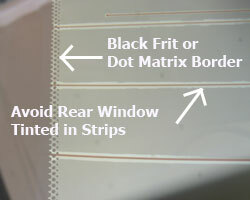 If the car you’re looking at has ‘frit’ edges (as shown in the image), take a closer look to ensure the film extends far enough to include the frit edges as well.When you look around the work area – is it clean and organized? Are the window films and tools carefully and expertly laid out? Outdoor work areas should always be avoided, as it is extremely important to install window tinting in a dust-free, indoor environment. Now move around and inspect the tint on the side-windows. Make sure the film covers the inside of the window and sits tight along the edges. If you look closely at the window film in particular, do you notice bubbles of air, or see spots where the film isn’t sitting flush against the window? If so, this is a dead giveaway of a lazy tint job. On the other hand, if the film is a bit discolored or streaky, you shouldn’t worry too much as it does take a few weeks for window film to fully dry and show up as clear. Is there any reason you can’t just do your own window tint? Are you the handyman at home? If you’d like to skip the shops, you can get DIY car tint kits from $60 – $100 which are cut specifically to fit the make and model of your car. And once you’ve done it yourself a few times, you’ll have enough experience to help out your family and friends with their own tint jobs. Even if you mess up, most reputable tint kit shops have extra film programs that allow you to purchase single pieces of film rather than an entire kit. Whether you want to go it alone or use our Free Online Price Quote service, keep in mind the color, type and darkness of the film you would like. Don’t accept ‘the next best thing’ if the dealer doesn’t stock what you want – instead, just move on, as you will most certainly find a tint shop elsewhere that offers your desired tint. After getting your hands on several quotes and having researched all the shops on your shortlist, you should now feel free to make your final choice between them. If you are still not sure about the prices, reviewing the cost of car tint article will give you some hints about what you’re looking at. And last but not least, once you know which tint shop you are going with, be sure to make an appointment with them beforehand. Some tint shops offer a “drop-in any time” service, but if you want the best possible job done you’ll want to give them some time to prepare. Tinting takes a few hours to complete even by a prepared professional, so you may want to arrange a lift with someone when you take your car in. Good luck and enjoy your new tint! More information about various home tint options, installation, and purchase advice. Learn more about car window tinting, tint shops, and state tint laws. How Much Does Car Tint Cost? How Long Does Auto Tinting Last?